Charity starts at home and we need more people to reach out to the homeless and less fortunate. With so many cities making it illegal to reach out one way we can make a difference is to work with those that have set up organizations to help. I know this one personally and I volunteer there. These people have a heart for God and compassion for the people that have needs that nobody else can help them with. They help people recover their lost identification documents, they feed people, they help them get much needed supplies like clothing, shampoo, toothpaste and more. They also help people get medical care, shelter, and transportation. That is just the tip of the iceberg and they need support! I for one will give support to this wonderful Ministry. With all the disasters that are making people homeless all over the USA today this is a Ministry that is truly needed. I can’t help but think that I could be in this position someday and I would want someone to care enough to help me. I have been homeless and it is no fun. Thank you for your kind donations. God bless you! The heart is a delicate part of the human being, and by that we are not talking about the physical heart, but the metaphysical one, the core of our being, our personality. It is the place from where the rhythm of our lives flows. The bible says we should guard our heart with all diligence because out of it flows the issue of life (Proverbs 4:23). The point is, you cannot control what flows from your heart, but you can control what flows to it, in the influences you subject it to. This page surveys the plethora of Hebew names and Titles for God the Son, Yeshua Hamashiach, as found in the Brit Chadashah. They are listed in alphabetical order, with the Hebrew spelling, common transliteration, and English phonetics folowing. Scriptural references are included for each name. After reading through this list you should be absolutely awestruck at the amount of direct revelation we have been given that Yeshua Hamashiach is indeed God the Son! A Contemplation[a] of Ethan the Ezrahite. With my mouth will I make known Your faithfulness to all generations. 6 For who in the heavens can be compared to the Lord? Who among the sons of the mighty can be likened to theLord? And to be held in reverence by all those around Him. Strong is Your hand, and high is Your right hand. 15 Blessed are the people who know the joyful sound! Also My arm shall strengthen him. And plague those who hate him. And his right hand over the rivers. You have been furious with Your anointed. You have profaned his crown by casting it to the ground. He is a reproach to his neighbors. And have not sustained him in the battle. And cast his throne down to the ground. For what futility have You created all the children of men? 48 What man can live and not see death? Which You swore to David in Your truth? 52 Blessed be the Lord forevermore! Psalm 89:19 Following many Hebrew manuscripts; Masoretic Text, Septuagint, Targum, and Vulgate read holy ones. 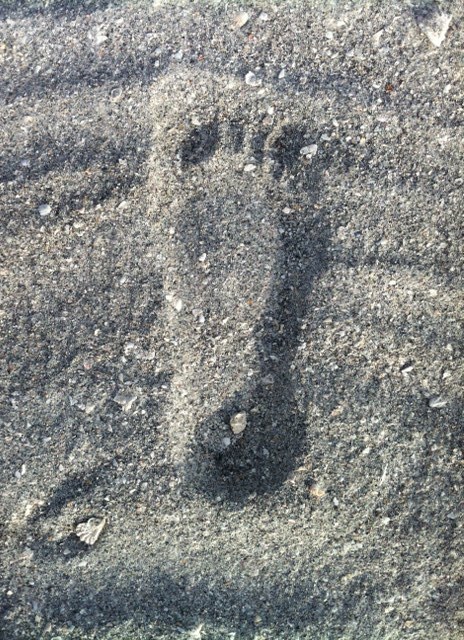 I took this photo of a footprint in the sand at the beach a week ago. When I went back and looked at it, instead of looking like an impression of a footprint in the sand, it looked more like a raised footprint built up in the sand. I am not a photographer and can’t explain why it looks so different in the picture than it did in person. It is all about perception. How often is our perception of a person or a situation skewed by our personal perspective? Too often we look at a person or situation and decide why someone acted a particular way or why a situation turned out a specific way. When we do so, we are ascribing motives and variables than may not exist and our perception may be a bit off. A look at the subject of colours which can help build knowledge, love and reverence of the One who has given His only begotten Son that we might find salvation.